Background: The incidence of non neoplastic lesions are much more common in epididymis. Clinically, epididymal nodules are easily accessible to fine needle aspiration cytology (FNAC) procedure. There are very few literature reports documenting the role of cytology in evaluation of epididymal nodules. Thus, we studied patients presenting with palpable epididymis nodules in the out patient department (OPD) from a tertiary care general hospital. Aim: This study is aimed to put forth the diagnostic utility of FNAC in palpable lesions of epididymis. Materials and Methods: A total of 40 palpable epididymal nodules were aspirated as a routine OPD procedure as part of this study. Smears were fixed in isopropyl alcohol and air dried. In all the cases, wet fixed papanicoloau stained and air dried giemsa stained smears were studied. Zeihl Neelsen stain was performed in cases which yielded caseous aspirate. 14 cases (35%) of tuberculous granulomatous inflammation, 10 (25%) cystic nodules (9 spermatoceles and 1 encysted hydrocele), 5 (12.5%) of nonspecific inflammations, 3 (7.5%) filarial infection, 3 (7.5%) sperm granulomas and 3 (7.5%) adenomatous hyperplasia of rete testes. Except for the two tumors, one adenomatous hyperplasia and one tuberculous lesion, no other lesion was excised. Follow up and response to therapy was available in 78% patients and resolution indicated appropriateness of the diagnosis. Conclusions: Thus, as most of the lesions in epididymis are non neoplastic responding to medical line of treatment and FNAC served to aid diagnosis of non specific inflammation and avoid surgical excision in most cases. Epididymis is a site for a variety of non-neoplastic and neoplastic lesions, predominantly the former. Clinically most of these lesions produce worrisome palpable nodules, and fine-needle aspiration is just the procedure that seeks to confirm the non-neoplastic nature of most lesions and guide patient management strategies accordingly. Most non-neoplastic lesions are managed conservatively, avoiding unnecessary surgical excision. We hereby report our experience with fine needle aspiration cytology (FNAC) in the treatment of 40 patients with epididymal nodules from a general hospital, with a view to highlight the simplicity of the technique and high accuracy of diagnosis. A total of 40 patients with epididymal nodules were aspirated during a period of eight years. All the aspirations were carried out using a 23-gauge needle and a 20-mL syringe. Aspiration was done with the patient in supine position and without local anesthesia, by the pathologist only. Two-to-three passes were made in each case. Only in cases where patient complained of pain or the nodules were tender, the urologic surgeon accompanied the patient and gave a cord block or local anesthesia as required. In case of cystic swellings, excess fluid was drained and residual aspiration was done. Smears were fixed in isopropyl alcohol and air-dried. In all the cases, wet-fixed Papanicolaou-stained and air-dried Giemsa-stained smears were studied. The ages of patients were in the wide range of 10 to 45 years; however, 28 (70%) patients were young adults aged 21-30 years. Four patients each (10%) were aged <20 years, 31-40years and >40 years, respectively. The inflammatory lesions occurred in the 21-30 years age group, whereas cystic nodules were common in the 31-40 years age group. Most of the patients had painless nodules, except in 3 cases of acute non-specific epididymitis, where the lesion was tender and painful. All these patients presented with epididymal nodules without concurrent testicular lesion. Non-neoplastic lesions constituted 14 (35%) cases of tuberculous granulomatous inflammation; 10, of cystic nodules (9 spermatoceles and 1 encysted hydrocele); 5 lesions, of non-specific inflammation; 3 (7.5%), of filarial infection; 3, of sperm granulomas; and 3, of probable adenomatous hyperplasia of rete testes. Except for the 2 adenomatoid tumors, 1 adenomatous hyperplasia and 1 tuberculous epididymitis, histopathological confirmation was not obtained; however, accuracy of diagnosis could be judged from the clinical response to treatment, and such clinico-cytologic or histologic correlation was obtained in 78% of the non-neoplastic cases. Most inflammatory pathologic lesions regressed, confirming the cytology diagnosis. The nodules were firm, indurated and 1-2 cm in size. 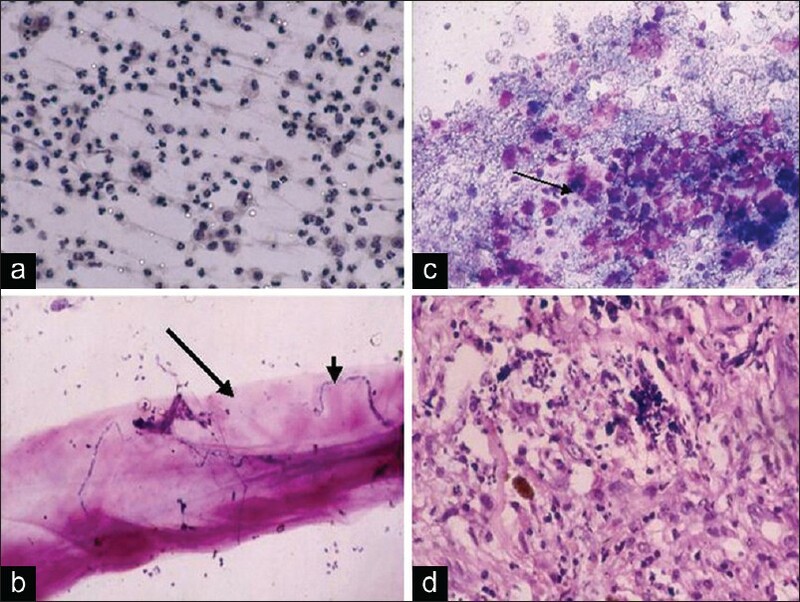 Smears revealed epithelioid granulomas with or without Langhans giant cells in 6 patients, whereas caseous necrotic materials with polymorphs and degenerating granulomas were seen in 8 patients [Figure 1]a. The Ziehl-Neelsen staining on air-dried smears revealed acid-fast bacilli in 6 of the 12 patients [Figure 1]b. In 5 patients, genitourinary tuberculosis was confirmed on clinical evaluation. All the patients received anti-tuberculous treatment, and in 5 patients the nodules totally disappeared following completion of treatment; while in the remaining, partial response was observed. Only 1 patient underwent curative surgical excision for non-responsive disease [Figure 1]c and d.
Cytology in these patients revealed acute inflammatory cells in 3 cases [Figure 2]a and chronic inflammation in the other 2 cases. In addition, native tall columnar glandular epithelium with intra-cytoplasmic polymorphs was seen in acute epididymitis. Microbiologic studies demonstrated streptococci in 2 patients. All showed good response after one week, with shrinkage in size following antibiotic treatment. All these patients presented with nodular swelling of the epididymis 2-3 cm in size. Aspiration revealed microfilarial worms in all the cases. An entire adult worm was aspirated along with the hyaline sheath of the parasite in 1 patient [Figure 2]b. While the background eosinophils were variable in all aspirates, only 1 patient had presence of peripheral blood eosinophilia. Most patients had 3-5 cm-sized nodules which on aspiration showed plenty of degenerating sperms amongst inflammatory cells; "foreign body" type of giant cells; and histiocytes, few of which had also engulfed the sperms [Figure 2]c and d. Epithelioid histiocytes seen in tuberculous lesions were not seen in these aspirates. Two of the patients gave history of trauma. Corroboratory histological diagnosis was available in 2 of these 3 cases. Most of these patients had cystic swellings that yielded clear straw-colored fluid, with decrease in size following aspiration. Cytology smears demonstrated numerous sperms on a clear background. Lack of inflammation and foreign-body giant cells helped to distinguish the condition from a sperm granuloma. Few cyst macrophages were seen, but inflammation was scant or absent. Three of the patients, on enquiry, gave past history of surgery for inguinal hernia [Figure 3]a and b. This solitary patient came with cystic epididymal swelling 4cm in size, and aspiration drew a clear fluid with plenty of lymphocytes and few mesothelial cells [Figure 3]c.
Most of these patients presented with painless 2-3 cm-sized nodular swellings around the testes. Though the lesions were thought to be in epididymis, subsequent histology in 1patient confirmed the diagnosis of adenomatous hyperplasia of the rete testes and assisted us in extrapolating the results in the other 2 cases. Smears from these nodules revealed cellular aspirates with clusters of polygonal-to-cuboidal epithelial cells with vesicular nucleus and a moderate amount of cytoplasm along with sperm heads sticking to the epithelial cells [Figure 3]d. As opposed to an aspirate from adenomatoid tumor, the nuclei of cells were smaller and the cytoplasm was less abundant. Histology in 1 case revealed tubulopapillary epithelial proliferation of rete testis lined by cuboidal bland cells. Both the patients had 3-4 cm-sized painless nodules which on cytology showed clusters of oval-to-polygonal cells with moderate-to-abundant optically clear or vacuolated cytoplasm with molding nuclear membrane [Figure 4]a-c. The nuclear chromatin was finely dispersed; and in the Giemsa stain, the para-nuclear cytoplasm appeared pink. Both the cases were diagnosed on cytology, and patients underwent limited excision. 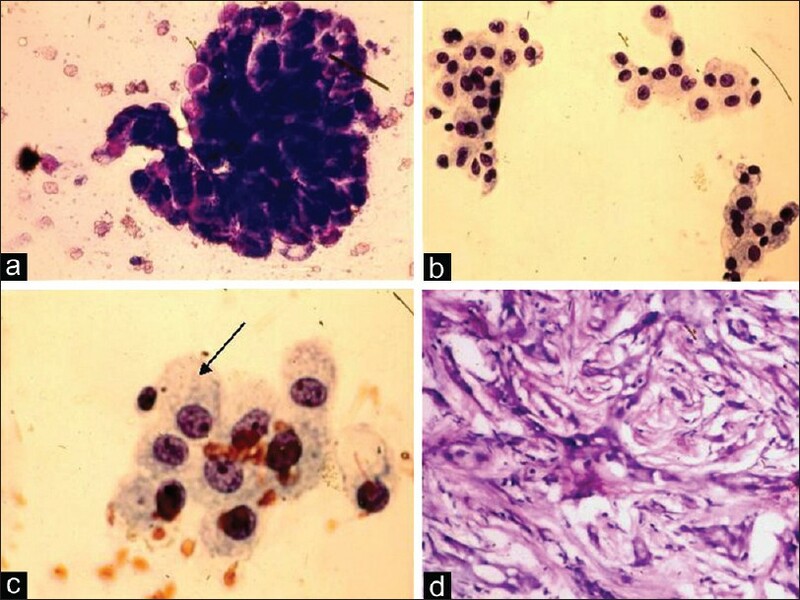 Histopathology confirmed the cytological diagnosis of adenomatoid tumor in both cases [Figure 4]d.
Although a simple and easy procedure, there are only few literature reports officially documenting the role of cytology in evaluation of epididymal nodules. This could be because epididymal nodules are overall uncommon in clinical practice. As seen in this study, fine-needle aspiration cytology (FNAC) proved to be useful in the management of patients with epididymal nodules. Besides diagnostic purposes, FNAC can be used to obtain material for culture studies in patients with infections. FNA material could be used to detect organism-specific antigens, e.g., Chlamydial antigens can be detected using specific techniques like immunohistochemistry and in situ hybridization. Most of the reports on use of FNAC in epididymal nodules are from India, which may be due to the dominance of higher genital infections in poor patients and high prevalence of tuberculous lesions of genitourinary tract. The spectrum of lesions encountered in our study is similar to that reported earlier. ,, FNAC has an overall sensitivity and specificity of 90%, respectively, for diagnosing chronic epididymal lesions, with a positive predictive value of 87.5%;  similar high accuracy was observed in our study. Most (95%) of the cases in our study were of non-neoplastic lesions, which were treated mainly non-surgically. Also the cytologic diagnosis of tuberculous epididymitis prompts a search for genitourinary tuberculosis, and thus FNAC helps in guiding the investigations and treatment of these patients. Most lesions are accurately diagnosed if their inflammatory nature is recognized. Most commonly encountered lesion in India is tuberculous epididymitis. As seen, the typical cytology features aid recognition in most cases. In cases where necrosis predominates, it is difficult to distinguish between tuberculosis and acute suppurative inflammation. In such cases, attention to the granular caseous debris and demonstration of AFB either in directly prepared smears or in those obtained from urine culture; or response to anti-tuberculous therapy can aid in accurate recognition. In some cases, the fibrosis associated with the tuberculous inflammation leads to a misdiagnosis clinically of malignancy. FNAC thus serves as a minimally invasive technique in the diagnosis of tuberculous epididymitis and epididymo-orchitis and provides adequate material for cytologic and microbiologic examination, avoiding unnecessary surgeries. The second common infection encountered in epididymis in our population appears to be microfilarial infection. The preferential site of location of the adult worms is the intra-scrotal juxtatesticular lymphatic vessels in 'nests' along the lymphatic vessels of the epididymis, spermatic cord and para-testicular region;  and ultrasound with an FNAC can serve as a cost-effective solution to rule out a filarial infection in males. A study by Mitra et al. described aspirates from 4 scrotal swellings which showed numerous coiled and uncoiled sheathed microfilariae along with neutrophils, eosinophils and few lymphocytes. Thus aspirates from epididymal nodules of microfilarial infection can yield microfilaria with variable amount of inflammation, and the cytopathologist should screen all aspirates from epididymal nodules with eosinophils for the presence of this parasite. The last pattern in epididymis aspirates is an epithelial dominant pattern. While the prominent tumor in the epididymis is an adenomatoid tumor, some epithelial proliferations either associated with inflammation  or with an adenomatous hyperplasia of the rete testis can mimic an adenomatoid tumor. As opposed to an adenomatoid tumor, the epithelial cells in the latter show lesser amounts of cytoplasm which is not vacuolated and arranged in flat sheets; in contrast to that in adenomatoid tumor, where epithelium is abundant and arranged in branching cords and glandular patterns. , The cells are round to oval, having eccentric, vesicular nuclei with a fine granular chromatin along with a pale/vacuolated cytoplasm. These cytological descriptions of Adenomatoid tumor (AT) described by Kalyani et al. are identical to the cytological features noted in both our cases. Likewise an adenomatoid tumor will mimic a host of testicular and para-testicular neoplasms; however, awareness of typical cytologic findings helps in accurate diagnosis. We have not come across any reference describing adenomatous hyperplasia of rete testis, but absence of typical branching glands of an adenomatoid tumor was a useful clue to rule out the latter. Thus FNAC serves as an important tool to screen and diagnose all palpable lesions of the epididymis and provides sufficient information for the initiation of treatment without need for an open biopsy. Awareness of cytologic findings goes a long way in sub-classifying most of these lesions. 1. Perez-Guillermo M, Sola Perez J. Aspiration cytology of palpable lesions of scrotal content. Diagn cytopathol 1990;6:169-77. 2. Rege JD, Amarapurkar AD, Phatak AM. 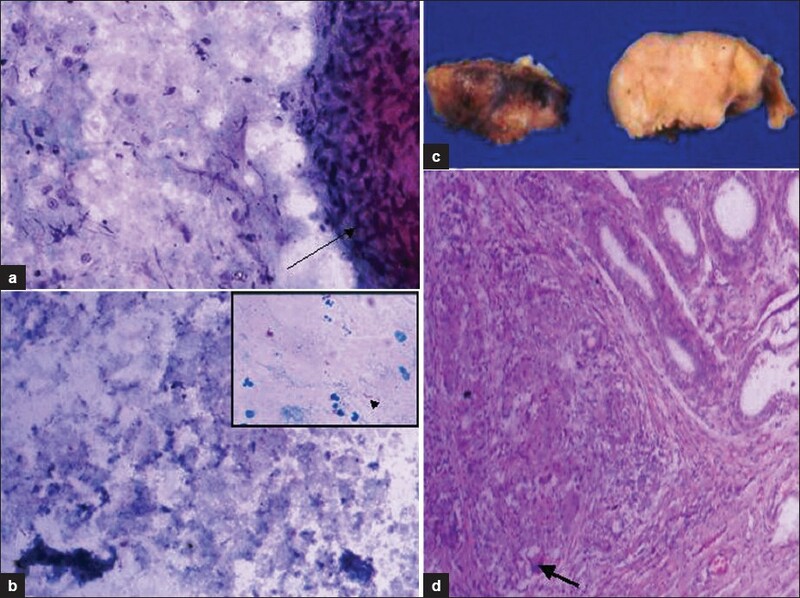 Fine needle aspiration cytology of adenomatoid tumor: A case report. Acta Cytol 1999;43:495-7. 3. Viswaroop B, Johnson P, Kurian S, Chacko N, Kekre N, Gopalakrishnan G. Fine needle aspiration cytology versus open biopsy for evaluation of chronic epididymal lesions: a prospective study. Scand J Urol Nephrol 2005;39:219-21. 4. Tewari R, Mishra MN, Salopal TK. The role of fine needle aspiration cytology in evaluation of epididymal nodular lesions. Acta Cytol 2007;51:168-70. 5. Gupta N, Rajwanshi A, Srinivasan R, Nijhawan R. Fine needle aspiration of epididymal nodules in Chandigarh, North India: an audit of 228 cases. Cytopathology 2006;17:195-8. 6. Sah SP, Bhadani PP, Regmi R, Tewari A, Raj GA. Fine needle aspiration cytology of tubercular epididymitis and epididymo-orchitis. Acta Cytol 2006;50:243-9. 7. Sachdev R, Roy S, Jain S. Tubercular epididymo-orchitis masquerading as testicular malignancy: an interesting case. Acta Cytol 2008;52:511-2. 8. Arora VK, Singh N, Bhatia A. Cytomorphologic profile of lymphatic filariasis. Acta Cytol 1996;40:948-52. 9. Reddy GS, Das LK, Pani SP. The preferential site of adult Wuchereria bancrofti: an ultrasound study of male asymptomatic microfilaria carriers in Pondicherry, India. Natl Med J India 2004;17:195-6. 10. Mitra SK, Mishra RK, Verma P. Cytological diagnosis of microfilariae in filariasis endemic areas of eastern Uttar Pradesh. J Cytol 2009;26:11-4. 11. 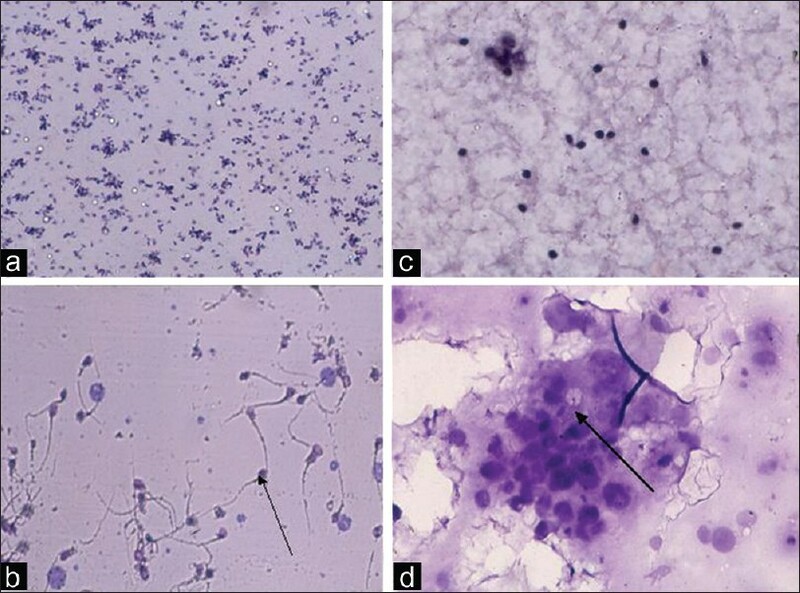 Perez-Guillermo M, Thor A, Lowhagen T. Spermatic granuloma: Diagnosis by fine needle aspiration cytology. Acta Cytol 1989;33:1-5. 12. Singh I, Dev G, Singh N. Chronic epididymitis (epididymal nodule) mimicking an adenomatoid tumor-case report with review of literature. Int Urol Nephrol 2002;34:219-22. 13. Perez- Guillermo M, Thor A, Lowhagen T. Paratesticular adenomatoid tumor-The cytologic presentation in fine needle aspiration biopsy. Acta Cytol 1989;33:6-10. 14. Kalyani R, Das S. Adenomatatoid tumor: Cytological diagnosis of two cases. J Cytol 2009;26:30-2.